This is the second time I’ve reviews this coffee. The first batch I received wasn’t as fresh as I had hoped, so Adam at Reunion Island Coffee sent me over 3 brand new fresh bags! Bullet Espresso in the Cup. Right off the top I have to say this is a pretty classic smelling/ tasting blend. I’m willing to bet it’s Brazil based with some accents. 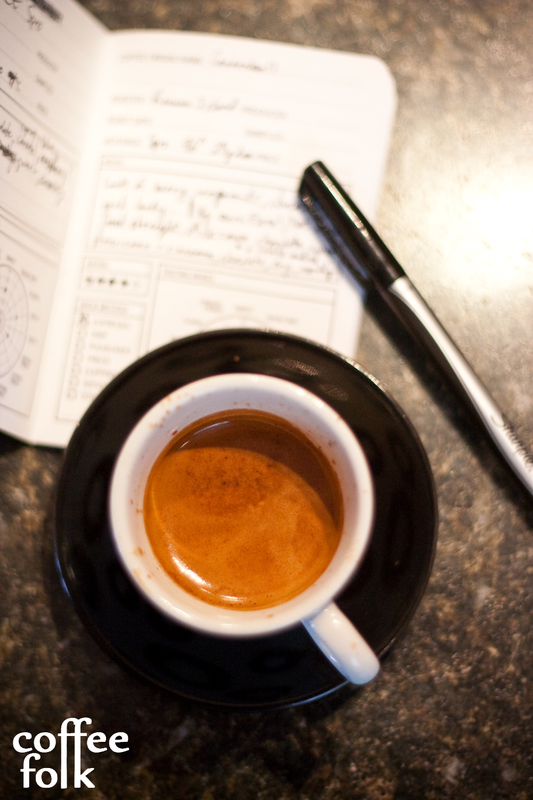 Working with this espresso was moderately easy. However, I found it peaked at about a 94°C temperature and with a pretty standard ~18gram dose. My notes were: aromatics of cinnamon and berry (raspberry/blackberry). Tasting chocolate, syrup/ toffee and slightly smoky. I also found like a cherry play in the cup rather than what they called blackberry. There was a pretty good sweetness, and a medium-high acidity. 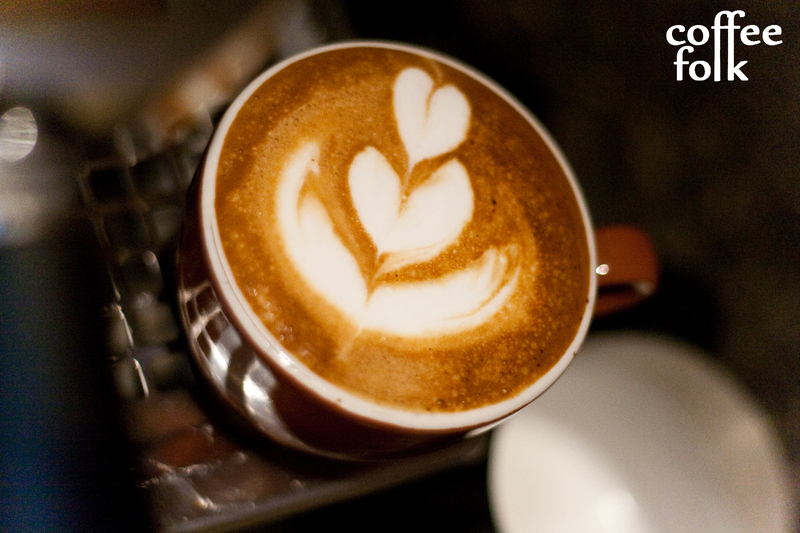 As a 6oz cappuccino, I found it to be nice and sweet with that acidity cutting through the milk really well. A lot more of the chocolate components were noticeable. As an americano I found it highlighted some of the notes I wasn’t very fussy about. It works, but it’s nothing special. Total 100 point score of 85/100. Bullet as a 6oz Cappuccino. Final thoughts: This would really be a great shop blend for most of the milk drinks and the occasional straight shot. A local place “Coffee and Company” pulls this on a regular basis and I’ve had some pretty good shots from there. I would [guess] this was designed to cut through milk with some small highlights (cherry/smokiness). Love it in milk, and enjoy it as a straight shot every once in a while. Good classic blend. 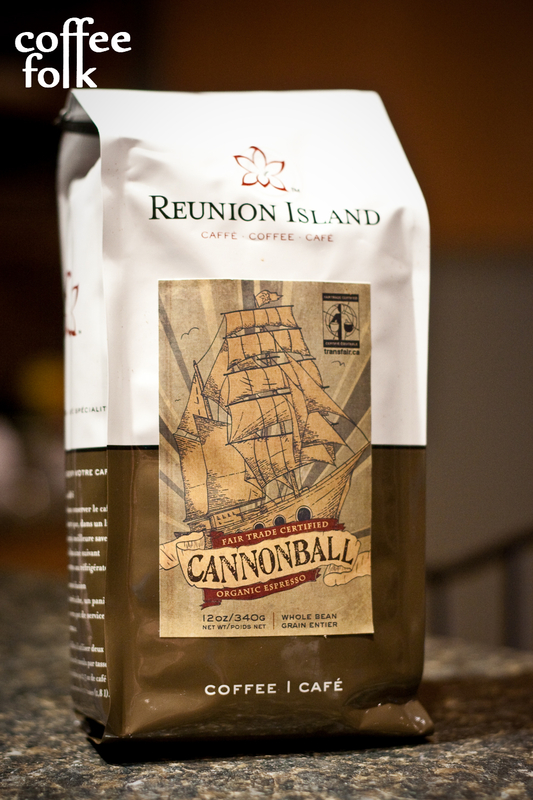 I was a lot more impressed with Reunion Island’s newer Cannonball. However, this lands a respectable 85/100. 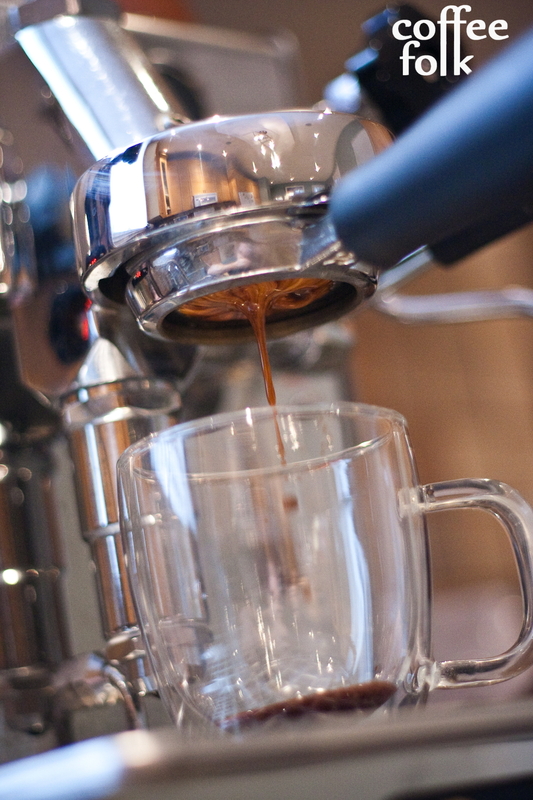 What is your favorite ‘classic blend’? And where is it pulled (shop and location)? Adam over at Reunion Island Coffee hooked me up with 3 bags of Cannonball Organic Espresso blend at the beginning of this week to put their newest espresso blend “Cannonball Organic” through rigorous testing. I was really, really excited to have enough coffee to try whatever I felt like and do the first in-depth review (formally) for this site. So, naturally, I took his advice when he advised this pulled better at higher temperature because of the “coffees from the Jinotega region of Nicaragua, northwestern Sumatra and Sidamo in Ethiopia” noted from the Reunion Island website. This only acted as a starting point however, and I took the time to pull straight shots of this from 93°C to 96°C. 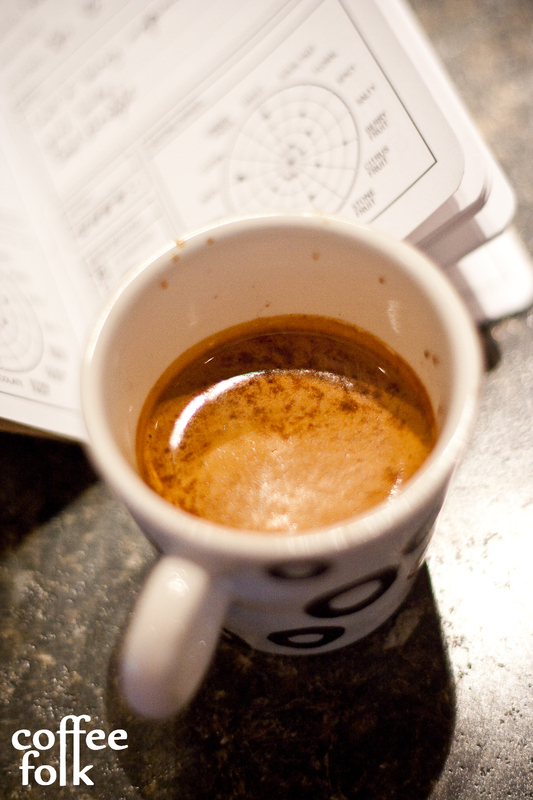 On top of this, I experimented with different doses and grind settings on the Mazzer. The results were… well… interesting. I was really impressed by this coffee, but not without the frustration of dialling this one in (grind, temperature, dose). Because this is a really delicate coffee and doesn’t have a traditional Brazil base, it was somewhat finicky. I was nearly discouraged by they first few shots, but keep going. I brewed one at 94°, the 95°, then 96°… and BAM. Berries! And lots of it. I found this one to be excellent at a really specific parameter, and that is 96°C with a ~20 gram dose and a grind size to accommodate for a ~28-30 second pull. Not exactly cafe friendly for here in Newfoundland where they just “lock and load” (but that’s another story). So this was a pretty delicious blend as a straight shot, I was impressed. Tasting notes were similar to what’s listed on the Reunion Island site, except I hardly found any orange. Cannonball in the cup. Double shot, with some tiger mottling. My notes were: loads of berry components, some stone fruit and a nice syrupy body. Floral components in the aroma and hints of chocolate all around*. Fairly sweet, but balanced by an apple-like acidity. When I turned this into a 6oz cappuccino, I found it to be nice and sweet and a lot more of the chocolate components were noticeable. The more delicate notes became muted however. The americano was interesting. When I pulled the shot into ~7oz of hot water, I found it to open up a little. I found some cinnamon components, earthiness, and a certain dryness. Definitely a winner on this front. Whew! We are almost at the end here. My final numbers for this are going to be as follows…. Total 100 point score of 90/100. I was pretty impressed with this coffee, and therefore I corrected this up a little to 90/100. If you are going to try and do this up, just be more careful with your brew time/ temp/ dose and treat it right! When it’s on, it’s really on! Berries, stone fruit, and some jam-like notes. You’ll know if you hit the spot. Normally when I do a review, a roaster sends out a bag of coffee for me to work with and taste. 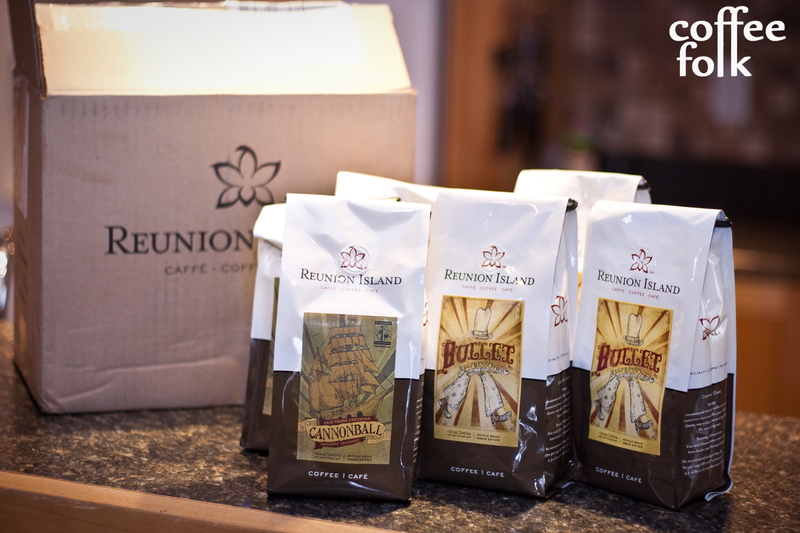 However, this week I received a huge package from Reunion Island Coffee with 6 bags of coffee. And boy, did that ever make me excited! 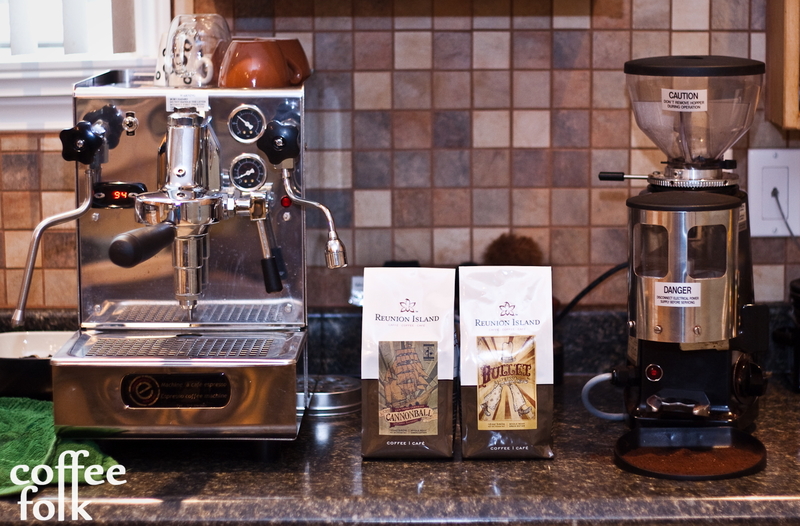 Right, so this week I have 3 bags of Cannonball Espresso blend, AND 3 bags of their Bullet Espresso blend. I’m excited because I can play around with dosage, temperature, and its effects as an americano and in milk. Anyway, I’ve only just begun testing. All my results will be posted sometime in the next week. I have to send out a HUGE thanks to Adam over at Reunion Island who has been emailing this week keeping in touch. It has been an awesome experience, one of the best to date.